Fire officials are warning people to be careful this weekend with the extreme dry conditions. Eleven wildfires this year, including the Dead Dog Fire pictured, are human-caused, according to officials. 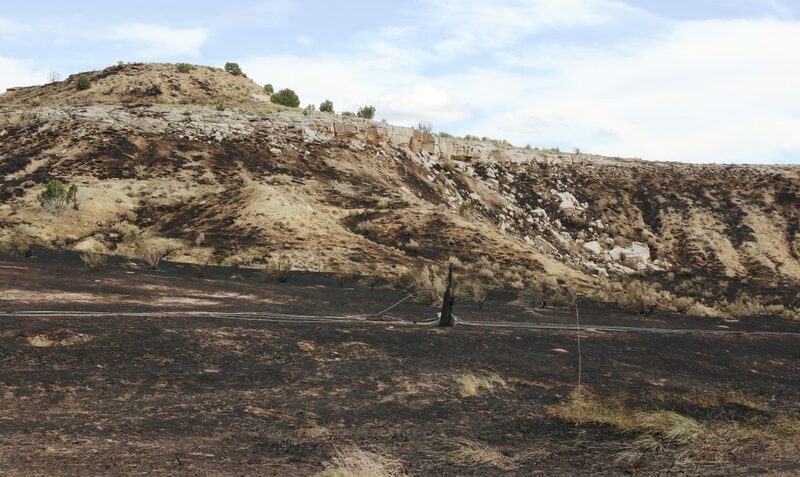 Fire officials with the Northwest Colorado Fire Management Unit are urging the public to be cautious this weekend as conditions continue to dry in northwestern Colorado. “While conditions across the unit have not reached the critical point where fire restrictions are warranted, people need to be aware that fire danger is currently high,” said Fire Management Officer Colt Mortenson. Precautions people should take include having a shovel and water on hand to extinguish campfires where permitted, avoiding parking in tall dry grass, or driving OHVs in areas where dry grass can be ignited by hot exhaust. It only takes one spark to start a wildfire – equipment should have working spark arresters, and trailers should be inspected to ensure chains are not dragging. So far this year the Northwest Unit has responded to 27 wildfires, 11 of which have been human-caused, including the 17,731-acre Dead Dog Fire near Rangely earlier this month. The State of Colorado maintains a website with the latest fire restrictions statewide at coemergency.com/p/fire-bans-danger.html.